Главная » Файлы » GTA » Проги..
Поддерживает и автоматически обновляет драйвера: принтеров и сканеров, USB, звука, Vista, Bluetooth, мыши и клавиатуры, Видео, RAID, модемов и сетевых карт, веб-камер, графических карт, VGA и других Windows-драйверов. 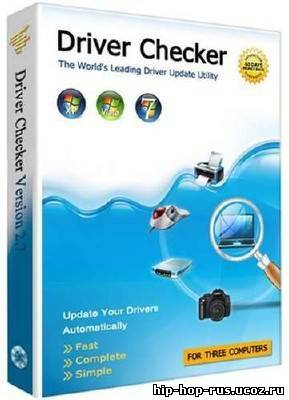 Driver Checker 2 allows you to easily detect and update the latest drivers for your entire hardware devices. It can also back up the existing drivers and restore the drivers in case that you needed to reinstall or upgrade your operating system. Driver Checker provides an easy-to-use interface through which only a few clicks can make your jobs completely done with ease. »»» Automatically update and maintain these drivers: Printer Drivers, USB Drivers, Sound/Audio Drivers, Vista Drivers, Bluetooth Drivers, Mouse Drivers, Keyboard Drivers, RAID Drivers, Scanner Drivers, Video Drivers, Modem Drivers, Network Drivers, Linksys Drivers, Webcam Drivers, Graphic Drivers, VGA Drivers & Other Windows Drivers.